President Trump's strict stance on trade could put 2.6 million American jobs at risk, the head of the Chamber of Commerce says. He sent the memo on the same day the administration said it would impose steep tariffs on steel and aluminum from three of America's biggest trading partners — Canada, Mexico and the European Union. The trade penalties, 25% on imported steel and 10% on imported aluminum, take effect at midnight. 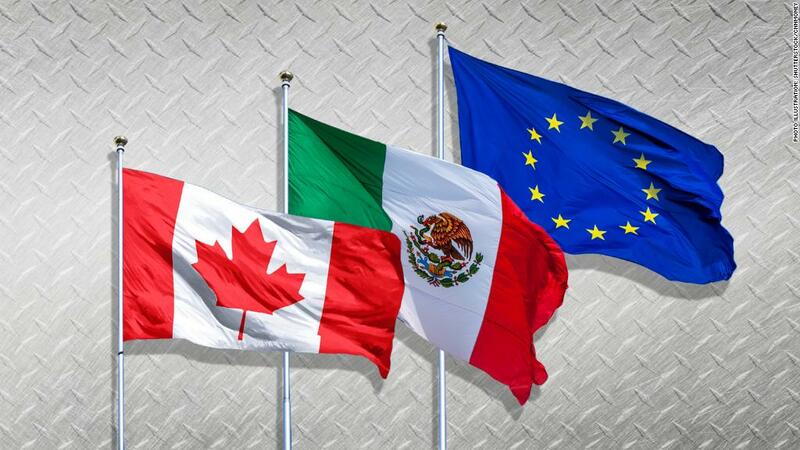 Canada, Mexico and the EU quickly announced plans to retaliate with their own tariffs on American goods. "On each of these issues, the Chamber has privately and publicly expressed our concerns to the administration and to Congress about the economic damage that an escalating series of back and forth tariffs would have on our own country," Donohue wrote. The White House did not immediately respond to a request for comment on the memo. The administration says the tariffs will boost American industries and correct unfair trade practices by other countries. Commerce Secretary Wilbur Ross told CNBC that retaliatory measures would affect less than 1% of the US economy, and that the tariffs will create American jobs. "When you're thinking about the overall economy, it's not just the trivial increase in product prices, it's also the increase in employment and the strength of the economy overall," he said. As tension rises between the United States and trading partners, attempts to renegotiate NAFTA are stalling. On Thursday, Canadian Prime Minister Justin Trudeau said he had offered to meet with Trump this month to finish negotiating a NAFTA deal. But he said Vice President Mike Pence told him that he'd have to accept a sunset clause, which would make the trade agreement subject to renegotiation every five years. Trudeau said he couldn't accept the terms. The sunset clause is just one sticking point. Donohue warned that the administration's harsh stance on trade could end up hurting the very constituents Trump is courting. "The current approach will deliver the greatest economic pain to precisely those areas of the country that the administration and the Congressional majority are counting on for continued political support," he said. "It is worth remembering that a tariff is nothing more than a tax, and it is not paid by the exporting country— it is paid by the American people," he added. The Business Roundtable wrote in a blog post on Thursday that "these tariffs and increased costs have already caused harm to U.S. businesses and workers," pointing to companies that have said the tariffs could force them to lay off employees to offset higher costs. — CNN's Jeremy Diamond and CNNMoney's Julia Horowitz and Chris Isidore contributed to this report.